This is your chance to take on the TCS Marathon or Half Marathon in the amazing city of Amsterdam! The Amsterdam Marathon starts at the Olympic stadium and follows part of the Olympic route along the Amstel River, past stately homes and of course a few windmills too! TCS’s Half Marathon course also offer some amazing views of Amsterdam starting at the Stadionweg, over the Utrechtse Bridge finishing in the Olympic Stadium. Sounds amazing? So what are you waiting for! Our fundraising team at Mayhew will be on hand to help you all the way and make sure you reach your goal. We know that all our runners are animal lovers and want to raise as much as possible for us therefore you will receive lots of materials and support to help you do this! 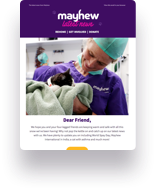 There are lots of ways that you can get involved with Mayhew.